With so many styles and options available these days, having a window tint professionally installed throughout your Portland home or office can do so much more than perform a practical service alone. Yes, a window tint can stop those ruinous UV rays from beating into your building all day long, keeping your expensive furniture and carpets from fading and deteriorating. A window tint could also cut down on crippling glares, allowing you to use both hands on your keyboard at work for once rather than shielding your eyes with one hand so you can see your computer screen. With such a window tint you might actually be able to get away with watching TV without having to squint through an entire program. Some tints even help protect the glass itself by providing an easy way to remove the graffiti so lovingly placed on a business owner’s property by Portland’s finest street artists. 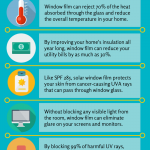 There is even a window tint that can block out unwanted heat during the hot Portland summer while retaining valuable heat in the damp, cool winter! Yet with all these useful functions, a window tint can allow you to add your own flare and personality to your residence or place of business. Anyone living around the Portland area knows that here, we’re all about self-expression and a window tint is a perfect way to show your neighbors or customers who you really are! One of our favorite things to do at Pacific Window Tinting is help you discover the perfect decorative design for your window tint. How about adding frost to your glass, adding beauty and privacy (these window tints can’t help but be practical)? Or maybe you think a green window would just really tie that room together. Have you always felt that having your company’s logo on your office door would add a touch of professionalism? We can do that too. If you can dream it, we can bring it to life. You have so many options to choose from and with our expertise, you are only limited by your imagination! Contact us today and let Pacific Window Tinting help you start making your Portland home or office look exactly the way you have always wanted.